It’s the New Moon, time to write the abundance check, light your green candle and allow the abundance to flow in. Crystal Elixirs are made with the earth energy of natural crystals, these energies can be extracted into liquids and administered into the body to regain health and healing. From my experience, crystals are conscious beings, and they are each endowed with the unique properties and abilities to heal and to enrich spiritual qualities. 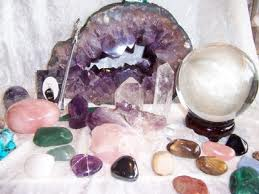 Working with crystals for more than 50 years I have experienced many wonderful factors, which can change a humans physical and emotional issues, create peace and well-being. The crystal elixirs can change our overall health and improve lives. As our Planet and physical bodies are ascending by taking in more light, our cellular structure is changing from carbon-based to crystalline-based. Therefore, integrating crystal essences into our lives assists us in staying balanced through the changes in our light body, which is anchoring in our Higher Selves on 5th-12th dimensional levels, levels that hold templates for perfect health and complete spiritual awareness. Spirit To Sole Connections Crystal Elixirs, carry high frequencies, as they are infused with Angelic, Archangelic, and Galactic energies. They can accelerate spiritual development, enable gifts and talents, and overall increase perception toward one of Unity, not duality. They can also protect and shield our energy fields from unwanted interference, repair our auras, and affect us on a cellular level by helping to restore our higher DNA template, one of 24+ strands. 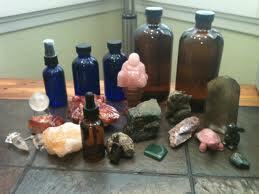 Essences work mainly via the Spiritual and Etheric Bodies, and then their effects filter into the Physical Realm. By repatterning the Etheric Template and physical cellular structure, they can assist in removing old programs and patterning, that leave us repeating situations that are not in our highest good, and perhaps even cause physical illness. The key to vibrant health and a greater spiritual awareness is to purify the body and spirit on all levels, so that a higher frequency of light can enter and then be held. Essences can initiate shifts in the body and consciousness so that a more healthy and multidimensional way of living can manifest. As we evolve, Crystal Elixirs assist in the flow of this process, and enable us to move forward with more grace and ease. Crystals and their vibrations are as individual as people–they have many purposes and work in many ways. And they work naturally, in synergy with you, which perfectly supports the body and spirit. They help to facilitate your own healing and awakening processes, and are a means by which your body can begin to heal itself. You are your own healer, which is very empowering. It is my intent to provide you with a natural means to address any health or spiritual issues you may be facing. Feel free to contact me any time with any questions or suggestions. Spirit To Sole Connection’s Crystal Elixirs, is my commitment to my path and to Spirit, and my commitment to you and your well-being.